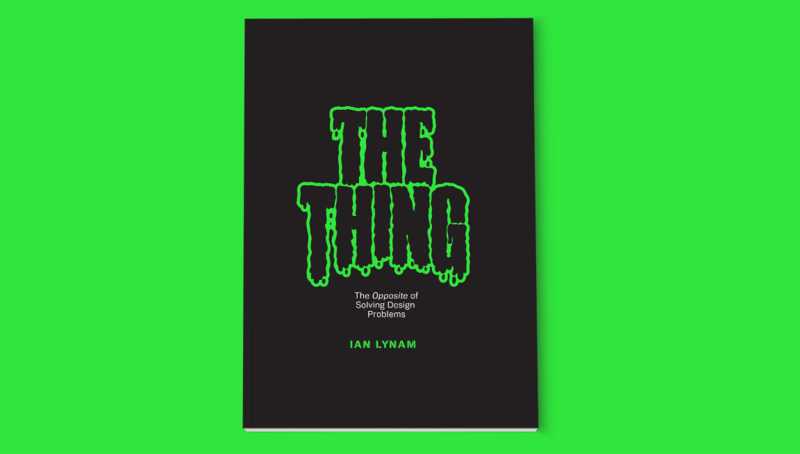 is a brand new 80-page booklet by Ian Lynam about Things—Things we've designed, designed Things that we have inherited, and Things so woven into our societies and cultures that we cannot extricate Them. Also, The Thing is a book that glows in the dark. The Thing is about the problematics of design, designers, and design history. Lovingly offset printed and screenprinted in a mix of three colors, The Thing mixes graphic design history, memoir, object studies, dismembered limbs, virgin tears, and blood sacrifice applied to some of the silkiest Japanese papers available. Not sold on it yet? The Thing is typeset in the Biwa and Biwa Stencil families of digital typefaces from Wordshape. Or alternately, check out our other new title Visual Strategies for the Apocalypse, a book about confronting creative constipation by Ian Lynam and friends. NOTE! Orders for both books will ship with glow-in-the-dark Wordshape stickers, as well as other fun extras. Buy the book for $15! Buy both books for $30! "Joyfully and skillfully straddling the line between creator and critic, theorist and practitioner, formalist and rebel, American and expatriate, serious analyst and humorous deconstructor, Ian Lynam always brings a wholly original perspective to his writing on design. The insights are always fresh, and the stakes are always extremely high." - W. David Marx, author of Ametora: How Japan Saved American Style. "Ian Lynam is a visionary designer, forcing us to challenge our assumptions about what design is, and what it can do. He constantly invites us to imagine new modes of inquiry, and makes a case for design as a fundamental way of knowing, and communicating, the world around us." "Lynam is a bitingly humorous writer - gifted with the intuition to give stories depth. This is no accident as he writes from experience - a reading pleasure!" After completing the Paypal-based ordering process, your book or books will be mailed to you within 24 hours. The Thing is a Wordshape project. Wordshape is a Tokyo-based type foundry, publisher, distributor of graphic design publications, and occasionally a software venture. All content copyright © Wordshape 2019.